One often hears the question, “How to get free nama aparadhas? Nāma āparādha cannot be counteracted through some ritual or just by chanting some slokas. One needs to reform or change one’s faulty mentality which caused the offenses in the first place. 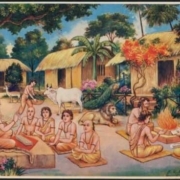 Be it envy, disrespect or just a faultfinding mind—all this must be consumed by the fire of repentance, nama-sankirtana and Vaisnava seva. Think I’m lower than grass! Feel insignificant, undeserving—just one atomic jiva! Honor all as better, higher, worthy and deserving! Jai Haridasa Thakura ki jai! Nama Sankirtana ki jai! Jaya Jaya Sri Radhe!